Developed by Osborne engineers, the system mounts on standard, single-gang electrical boxes at 120 or 240 volts and is easily installed by a certified electrician. The LED lights remain consistently bright, regardless of variable watt power. This means, if the temperature of a heat pad is controlled by a ramping controller to compensate for the reduction in heating required for piglet development, the LED lights remain consistently bright and visible, even as power is reduced to the pad. The heat pad indicator light is a powerful diagnostic tool. “For more than 40 years, producers have recognized Osborne’s Stanfield Heat Pads as the safest and most reliable method of providing under-body heat to baby pigs,” said Osborne’s Engineering Manager, Brent Brown. “The reliability of the Stanfield brand is further solidified with the addition of this new product. Farm personnel will now have a visual way to reaffirm their heat pads are operating properly.” The heat pad indicator light will alert producers to farrowing stalls requiring attention, so piglets are never without heat. 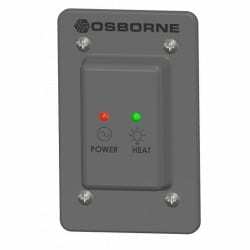 For more information on Osborne’s new heat pad indicator light, or Osborne’s complete line of pig production equipment, please call 1-800-255-0316 (1-785-346-2192) or visit osbornelivestockequipment.com.